“He’s too small!” We hear that all of the time and it’s a pile of horse crap. Ray Rice got the majority of touches for the Ravens this year and he’s only 5’8… Sproles is 5’6! Pound for pound, Sproles is the strongest Charger on the team and has the nickname “Tank” for a reason. 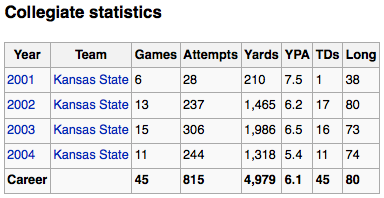 Let’s take a look and see what sproles has accomplished throughout his career. Darren Sproles played college football at Kansas State University from 2001 to 2004, starting all games in his last two seasons and setting 23 school records. He finished 11th on the all-time college rushing yards list, with the 6th most all-purpose yards in NCAA history. He led all FBS teams in rushing yards in 2003 with 1,986. He also led Kansas State University to its first Big 12 Conference championship in 2003, a win over # 1 ranked Oklahoma, 35–7. That same year he finished 5th in the Heisman Trophy voting. 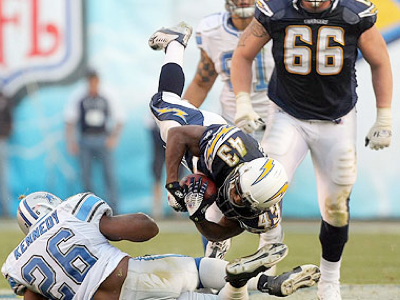 Darren sproles has been a dynamic player ever since he became a Charger. He missed his second year in the NFL with a broken leg, but returned to be the prolific player he has always been. Darren’s abilities are ridiculous! We finally got to see what he was capable of when LT went down before the ’08 -’09 playoffs. On January 3, 2009, during an AFC Wild card game against the Indianapolis Colts, Sproles ran for two touchdowns in place of the injured LaDainian Tomlinson, including the game-winning touchdown in overtime to beat the Colts 23-17. With 105 yards rushing, 45 yards receiving and 178 return yards, Sproles finished the game with 328 all-purpose yards in the Chargers victory over the Colts, the third most all-purpose yards by a player in a single NFL post-season game in NFL history. He was named the NBC Sunday Night Football “Horse Trailer Player of the Game” for the second consecutive week. The week following however, Sproles was stopped by the Pittsburgh Steelers. He managed only 15 yards on 11 carries, but did have 5 receptions for 91 yards including a 62-yard touchdown. This is not a fluke folks! Look what he did in college. If you play fantasy football, you know you want Darren in the whole game with no one else taking touches away from this guy. He’s faster than everyone else, shiftier, and more elusive than any back I have ever seen. This guy is exactly who we want between the 20’s and should feed him the ball 20 times a game because he has a chance to take it to the house every time he touches it.